Melt butter in a small pot over medium heat. Add egg and sugar to a bowl and whisk until combined. Stir in honey and add lemon zest. Stir to combine until a smooth batter forms. Sieve flour and baking powder into the batter, then add melted butter and stir to combine. Cover bowl with plastic wrap and let rest in the fridge for at least 3 hrs. Pre-heat oven to 210°C/410°F. Grease baking pan with butter. Remove batter from the fridge and transfer into a piping bag. 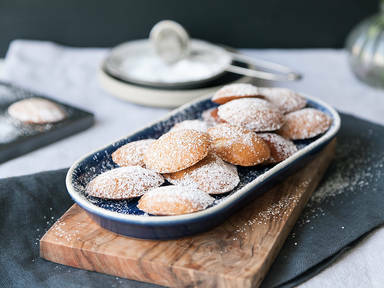 Cut off the tip and pipe batter into baking pan up to three quarters, so the madeleines have enough space to rise. Reduce baking temperature to 170°C/350°F and bake madeleines for approx. 12 – 15 min. until golden brown. Dust with confectioner’s sugar and enjoy!